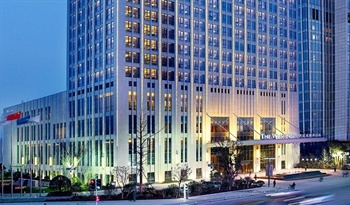 Located by Wanda Square downtown, the The Westin Hefei Baohe (Hefei Wanda Weisiting Jiudian) is within easy reach of local transportation networks. A short 15-minute drive sees guests to the Hefei Railway Station as well as the West Railway Station. Luogang Airport can be accessed in 25 minutes driving. This Hefei hotel houses a variety of well-designed rooms equipped with premium facilities. The wireless internet coverage includes the entire hotel. On-site dining options include palatable Chinese, whereas Western cuisine can be had at the Westin Grill House. Business travelers can avail themselves of the hotel's brand-new banquet hall and multifunctional hall which feature top-of-the-line equipment. For recreation, there is an indoor swimming pool and a spa.